10/26/18: Click HERE to read an article regarding a fish habitat enhancement project recently completed on Camano Island. The Greenbank Marsh project site includes a roughly 19-acre freshwater marsh located west of North Bluff Road and 3 acres of brackish tidal lagoon and adjacent nearshore east of North Bluff Road. 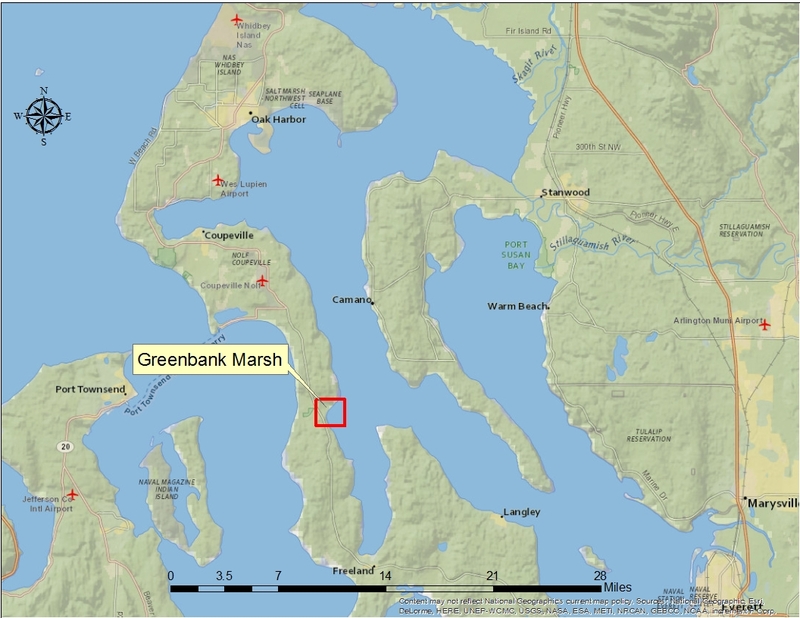 The lagoon is owned by the Greenbank Beach and Boat Club (GBBC); the marsh is owned by GBBC and by the Port of Coupeville as part of its Greenbank Farm property. 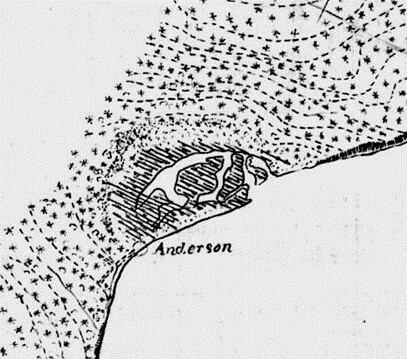 The 1888 T-sheet shows an extensive salt marsh/lagoon system open to Holmes Harbor. In the early 1900s a dike and tidegate were installed on what is now the GBBC property, isolating the marsh and lagoon from daily tidal connection with the Harbor. Other development activities over the past century, including land clearing and construction of homes and roads, have resulted in increased runoff flows. Drainage from a roughly 742-acre catchment area is eventually routed to an aging tidegate/outfall on the GBBC property. Environmental conditions and drainage concerns related to the marsh and lagoon are of great interest to property owners throughout the Greenbank Marsh and beach area. 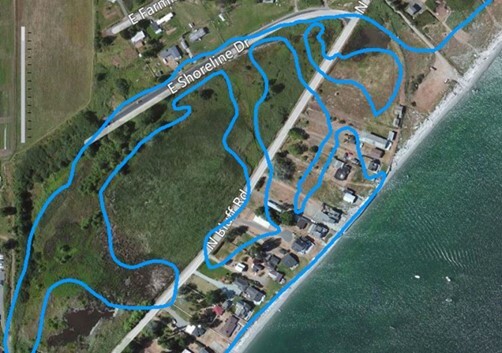 Since 2012, Whidbey Island Conservation District (WICD) has been assisting Greenbank Beach and Boat Club (GBBC) to address the deteriorating outfall on GBBC property. In 2013, WICD produced an Alternatives Analysis and Conceptual Design Report, which presented several pathways to address GBBC’s drainage system. This report concluded that further study was needed to adequately assess the feasibility of potential solutions. GBBC’s Board of Directors responded by forming a stormwater outfall committee in 2014 to evaluate their options. In early 2015, the outfall committee surveyed GBBC members to assess support for conducting further studies including the feasibility of restoring tidal connection to the marsh as a potential solution. 87% of respondents indicated support for additional study. 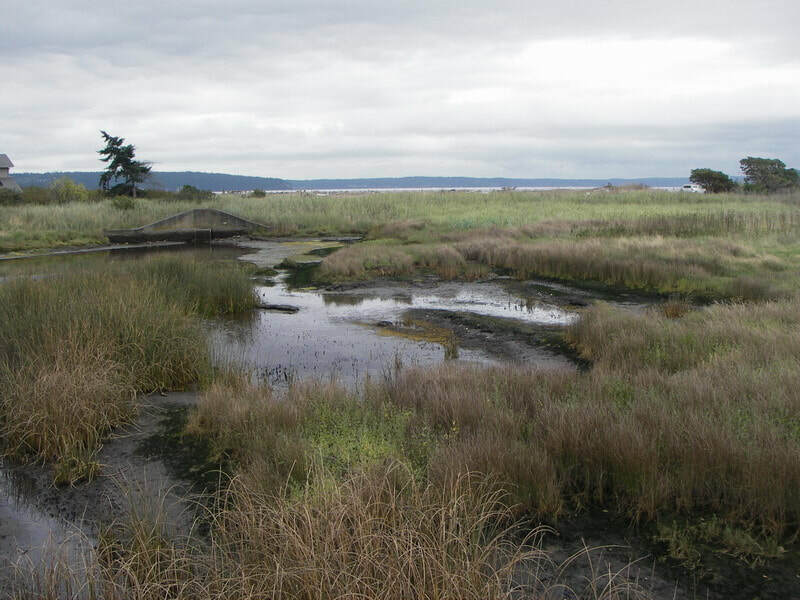 Phase 1 – 2016-2017 Greenbank Marsh Restoration Issues Assessment: Based on strong member support, GBBC’s board requested WICD assistance to apply for a grant from the WA State Recreation and Conservation Office (RCO). WICD was awarded funding in early 2016 to begin Phase I of the project, a Restoration Issues Assessment. The purpose of the Issues Assessment project was to identify and evaluate specific land use issues and physical site conditions fundamental to the design and implementation of measures to address drainage issues on GBBC property. By early 2017, GBBC members were presented results of this evaluation, including stakeholder feedback and updated conceptual design options. Members were then surveyed again to assess their support for the design alternatives presented. 75% of survey respondents indicated support for pursuing design of an “open channel” restoration project. Click HERE to access the Phase I webpage. GBBC, with support from WICD, recently received funding for a second grant from the RCO to fund the next phase of this project. The “Greenbank Marsh Restoration Design” is an intermediate phase of the project intended to refine the GBBC member-supported conceptual design into a “permit-ready” design for the subsequent construction phase. Primary tasks of this phase 2 will be to hire geotechnical and coastal engineering consultants to support WICD’s completion of 90% engineered designs and apply for construction permits. There will be extensive stakeholder outreach and consultation with GBBC members and through the Greenbank Marsh Working Group and the broader community. Click HERE to access the Phase 2 webpage. Greenbank Marsh Working Group: In June 2017, WICD and GBBC hosted a community meeting to update neighbors and stakeholders on the progress of the Issues Assessment project and request feedback. The information presented generated a lot of questions and concerns which lead to a proposal for additional stakeholder meetings. At the first of these meetings, on July 2nd, 2017, attendees agreed to informally organize into what is now known as the Greenbank Marsh Working Group. Click HERE to access the Greenbank Marsh Working Group webpage.